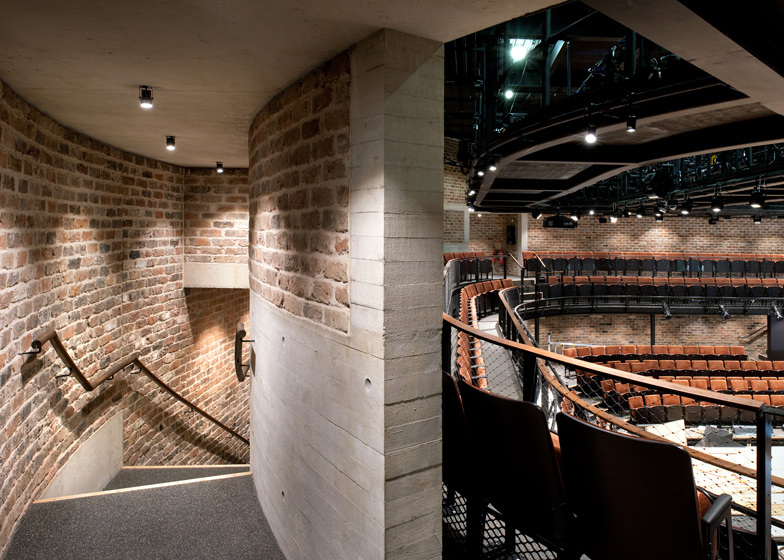 Behind the brickwork exterior of the new Everyman Theatre in Liverpool, England, architecture studio Haworth Tompkins designed a curved auditorium built from 25,000 reclaimed bricks (+ slideshow). 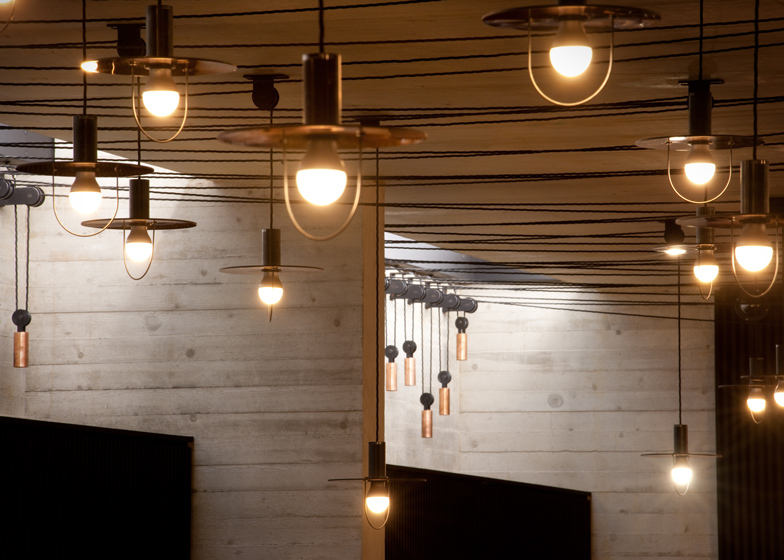 Haworth Tompkins was tasked with designing a new home for the popular theatre, previously housed in an nineteenth-century chapel, to make room for an expanding programme. Working on the same site, the architects tried to retain some features of the original building. 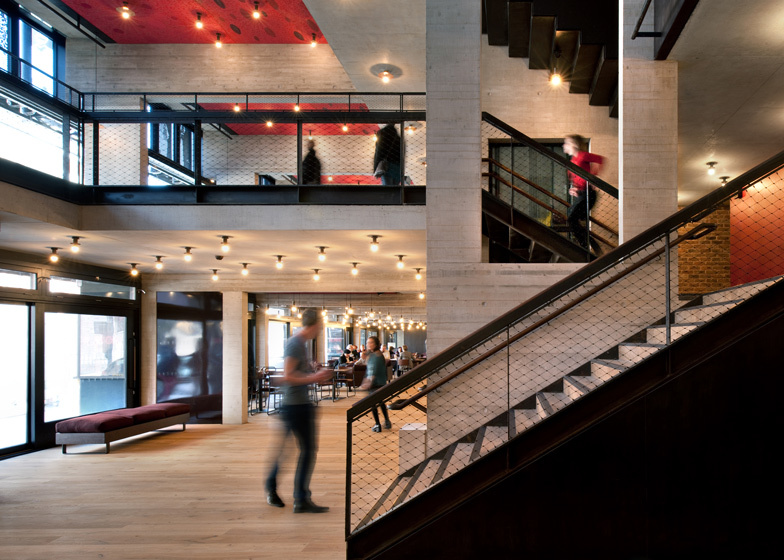 "The biggest challenge was to win over those who were worried the character of the Everyman would be lost in a new building," project architect Will Mesher told Dezeen. "The original Everyman had an informal character, described as somewhere you didn't have to dress up to go to, but could wear a ball gown if you felt like it," he said. "We tried to retain this spirit in the new spaces." The walls of the old building had to be carefully dismantled so that the bricks could be reused within the new theatre. These now form the main wall between the 400-seat auditorium and its surrounding foyer. Another distinctive feature of the new building is an animated facade where over 100 sunshades are etched with the portraits of some of Liverpool's residents, taken by local photographer Dan Kenyon. A glowing red sign in front references the original signage, while a row of large ventilation chimneys give the building a distinctive silhouette. The rest of the exterior is built from a typical local brick stock. 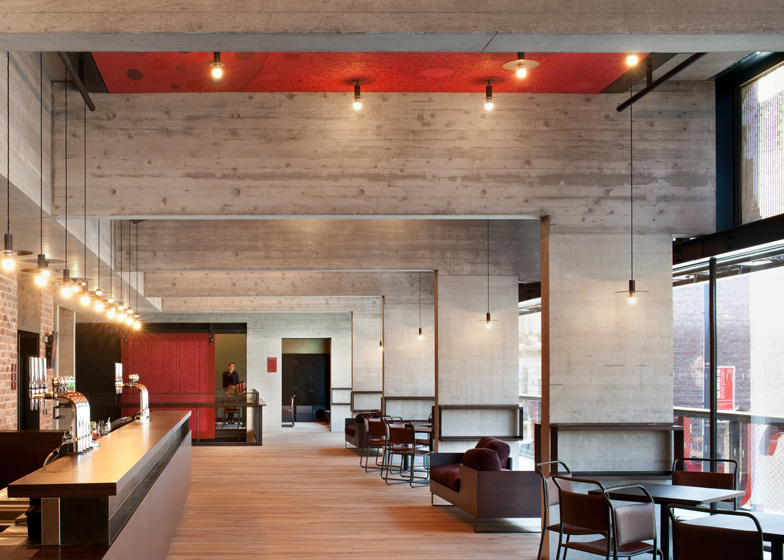 "It is a common material in the area, both in the nearby Georgian terraces and in the industrial and warehouse buildings to the rear, so brick serves to tie the theatre in with the surrounding streets," said Mesher. The building's interior is laid out over split levels to negotiate a slope across the site. This means public spaces such as the bar and foyer are arranged over several storeys, creating a tiered route from the street to the auditorium. A concrete structure is left exposed throughout these spaces and sits alongside a palette that includes black steel, oak and recycled iroko wood. "We looked for materials that would be robust and age well," said the architect. As well as the main auditorium, which features a thrust stage, the building accommodates a smaller performance space, a large rehearsal room, exhibition spaces and a writers' room. Photography is by Philip Vile, apart from where otherwise indicated. 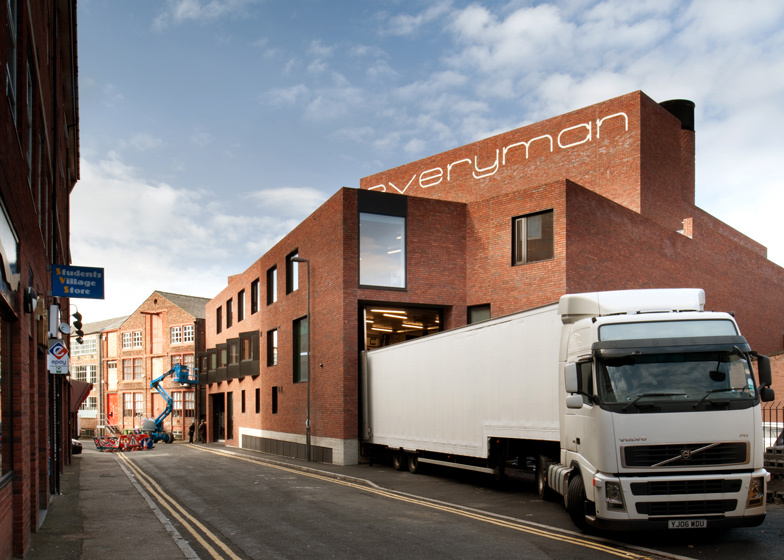 The Liverpool Everyman is a new theatre, won in open European competition, for an internationally regarded producing company. 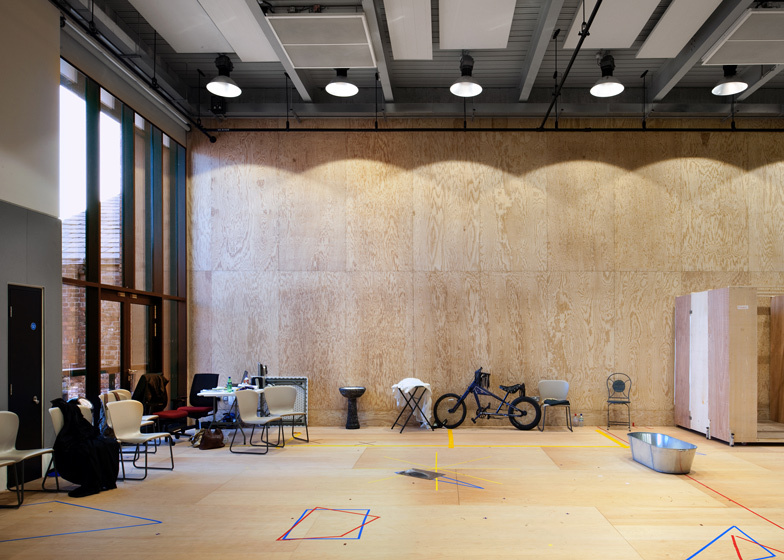 The scope of work includes a 400 seat adaptable auditorium, a smaller performance and development space, a large rehearsal room, public foyers, exhibition spaces, catering and bar facilities, along with supporting offices, workshops and ancillary spaces. The entire facade is a large, collaborative work of public art. The design combines thermally massive construction with a series of natural ventilation systems and low energy technical infrastructures to achieve a BREEAM Excellent rating for this complex and densely inhabited urban building. The Everyman holds an important place in Liverpool culture. The original theatre, converted from the 19th century Hope Hall chapel, had served the city well as a centre of creativity, conviviality and dissent (often centred in its subterranean Bistro) but by the new millennium the building was in need of complete replacement to serve a rapidly expanding production and participation programme. 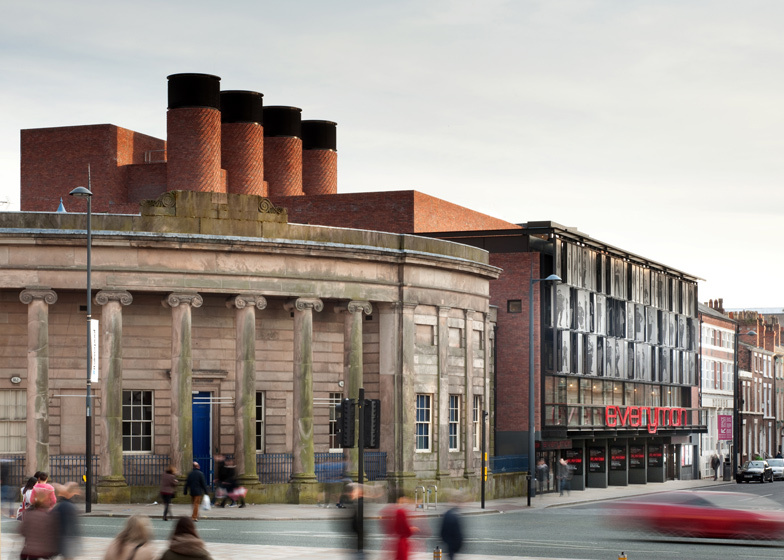 Haworth Tompkins' brief was to design a technically advanced and highly adaptable new theatre that would retain the friendly, demotic accessibility of the old building, project the organisation's values of cultural inclusion, community engagement and local creativity, and encapsulate the collective identity of the people of Liverpool. The new building occupies the same sensitive, historic city centre site in Hope Street, immediately adjacent to Liverpool's Catholic cathedral and surrounded by 18th and 19th century listed buildings, so a balance of sensitivity and announcement in the external public realm was a significant design criterion. Another central aspect of the brief was to design an urban public building with exceptional energy efficiency both in construction and in use. The building makes use of the complex and constrained site geometry by arranging the public spaces around a series of half levels, establishing a continuous winding promenade from street to auditorium. Foyers and catering spaces are arranged on three levels including a new Bistro, culminating in a long piano nobile foyer overlooking the street. 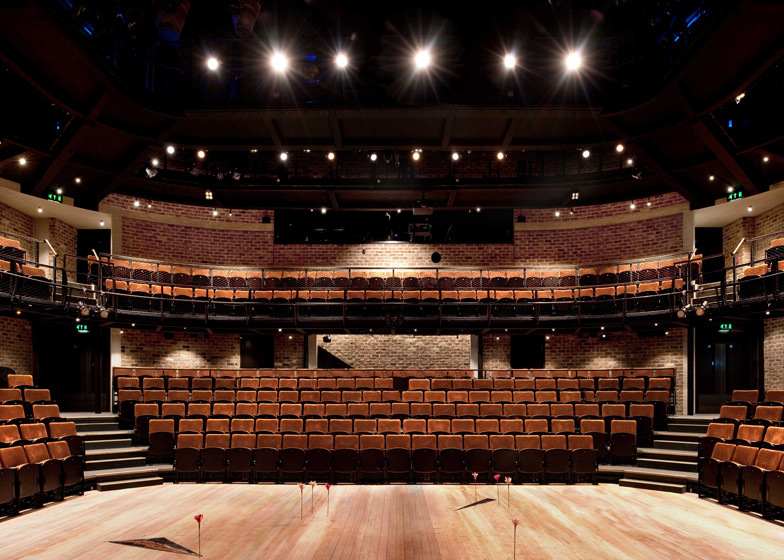 The auditorium is an adaptable thrust stage space of 400 seats, constructed from the reclaimed bricks of Hope Hall and manifesting itself as the internal walls of the foyers. The building incorporates numerous creative workspaces, with a rehearsal room, workshops, a sound studio, a Writers' Room overlooking the foyer, and EV1 - a special studio dedicated to the Young Everyman Playhouse education and community groups. A diverse disability group has monitored the design from the outset. Externally, local red brick was selected for the walls and four large ventilation stacks, giving the building a distinct silhouette and meshing it into the surrounding architecture. The main west-facing facade of the building is as a large-scale public work of art consisting of 105 moveable metal sunshades, each one carrying a life-sized, water-cut portrait of a contemporary Liverpool resident. Working with Liverpool photographer Dan Kenyon, the project engaged every section of the city's community in a series of public events, so that the completed building can be read as a collective family snapshot of the population in all its diversity. Typographer and artist Jake Tilson created a special font for a new version of the iconic red 'Everyman' sign, whilst regular collaborating visual artist Antoni Malinowski made a large painted ceiling piece for the foyer, to complement an internal palette of brickwork, black steel, oak, reclaimed Iroko, deeply coloured plywood and pale in situ concrete. 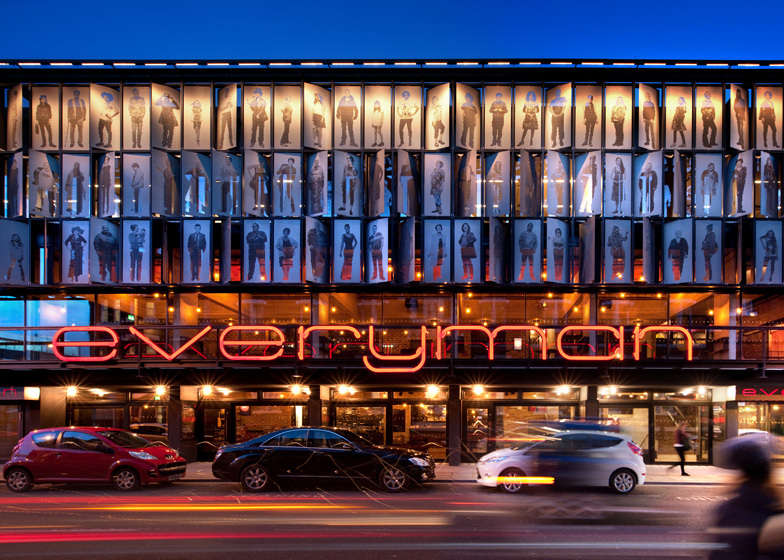 The Everyman has been conceived from the outset as an exemplar of sustainable good practice. An earlier feasibility study had included a much larger and more expensive building on a new site, but Haworth Tompkins argued for the importance of continuity and compactness on the original site. Carefully dismantling the existing structure, all the nineteenth century bricks were salvaged for reuse as the shell of the new auditorium and recycled the timbers of the roof structure. By making efficient use of the site footprint Haworth Tompkins avoided the need to acquire a bigger site and demolish more adjoining buildings. Together with the client team they distilled the space brief into its densest and most adaptable form. Having minimised the space and material requirement of the project, the fabric was designed to achieve a BREEAM Excellent rating, unusual for an urban theatre building. Natural ventilation for the main performance and workspaces is achieved via large roof vents and underfloor intake plenums, using thermal mass for pre-cooling, and the foyers are vented via opening screens and a large lightwell. The fully exposed concrete structure (with a high percentage of cement replacement) and reclaimed brickwork walls provide excellent thermal mass, while the orientation and fenestration design optimise solar response - the entire west facade is designed as a large screen of moveable sunshades. Offices and ancillary spaces are ventilated via opening windows. The building has taken almost a decade of intensive teamwork to conceive, achieve consensus, fundraise, design and build, and the design will ensure a long future life of enjoyment by a diverse population of artists, audiences and staff.